People wear lots of different kinds of clothing for indoor climbing. Those who just come for a day out often wear their regular clothes while people who practice climbing as a sport usually choose some form of sportswear. There are brands dedicated to climbing wear too. At the moment, I am usually wearing my old RTW sports trousers (sort of capri length). The trousers I made back in 2015 served me well for over a year but the fabric has suffered too much by now. I do usually wear some kind of me-made top though. Because I know it can be hard to find the right fabric for sportswear (or outdoor stuff, for that matter), I thought I wouldn't mind buying new trousers for climbing. Anyway, to make a long story short, I decided I would be better off trying to invent my own perfect version. I used a wide stretchy waistband which turned out to be way too loose (if I had not been wearing my harness, I'm not sure the trousers would have stayed on). I plan on cutting it off, making it smaller and inserting elastic for some added firm stretch. The fabric I used for the rest is my favorite cotton/linen blend which is really comfortable but might not be durable enough for sportswear. I am very happy with the special climbing details I added: The long crotch gusset allows for an excellent range of movement and the pleats at the knees seem to work too. 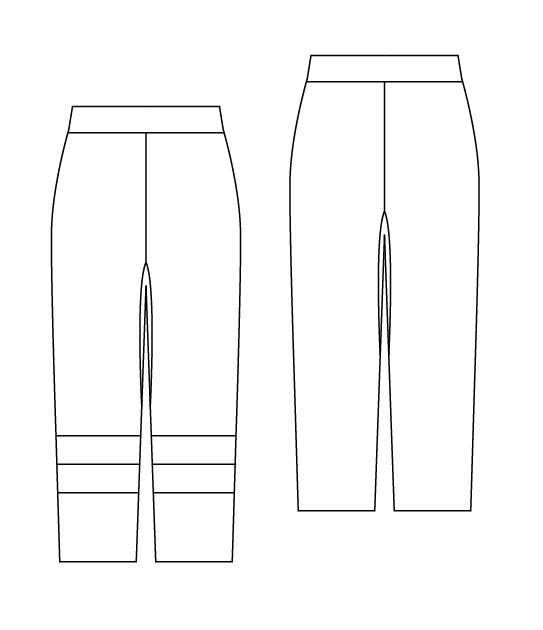 I may just pleat them the other way in the next version (they seem too tight the first time I bend my knees but are absolutely fine once they have been pushed open by that movement). 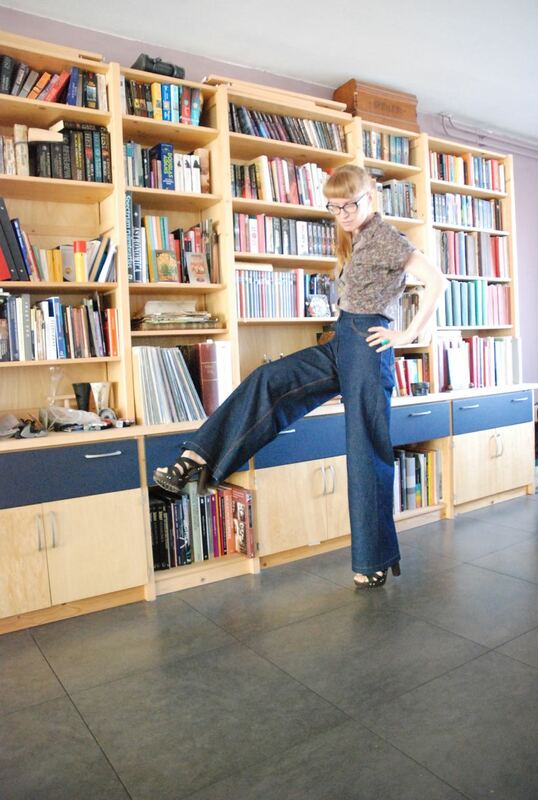 A new pair of retro-style jeans, that's what I promised you, isn't it? Which I did, in a bit of a hurry, on Sunday. But sometimes pictures just don't turn out that great. The lighting is rather bad on these (they're just a bit too bright) , my apologies. I used the pattern I drafted for my favorite calf length jeans. I just made them full length this time. And I adjusted the fit. I ended up taking in the side seams by a whopping 1.5 cm per seam at the hips and waist (so where-ever it is anywhere near close-fitting). 1.5 cm may not sound like much, but a it means loosing that amount on both the front and back pattern piece on both sides. So that's total circumference of loss of 6 cm. 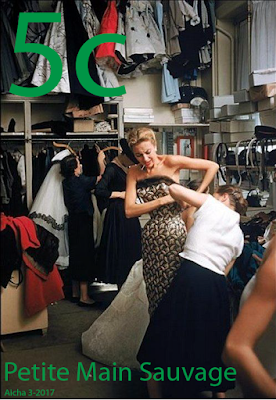 If you know that the usual difference in circumference between dress sizes is between 4 and 6 cm, that's a lot. 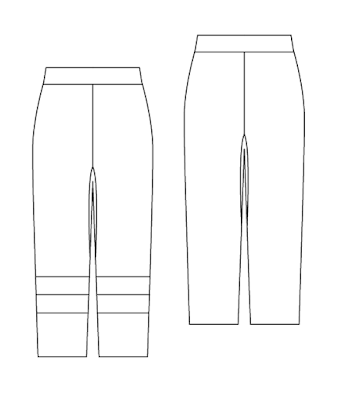 Especially for a custom drafted pattern. Of course, the pattern is a year-and-a-half old and I have been very sporty in that time. Clearly, that made a difference. I am quite happy with the finished product. I like the fit and the feel of the fabric. I like the retro feel of the design but I'm glad I didn't try to go completely "period". 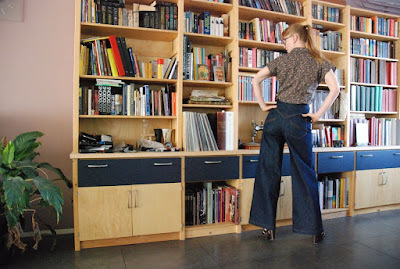 Jeans with wide legs were worn in the 1940's but those would have a much lower crotch. Despite having the waistband at the natural waist, I went for a much more modern kind of fit. I've tried the vintage style and I kind of like it but I think I still prefer a fit like this. As usual, I used flat-felled seams on the back yoke, center back seam and inner leg seams and stitched those with thick, golden yellow jeans thread. 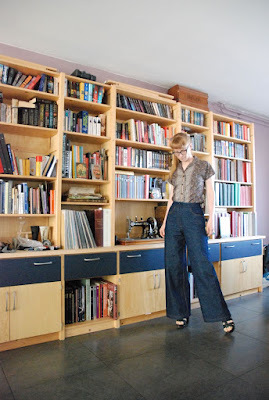 Fellow sewing blogger Tanit-Isis has an interesting statement on her blog (it is written under her profile picture): "Sewing is what I do when I'm cheating on all my other hobbies..."
Nice, isn't it? I don't know how demanding her other hobbies are but for me, sewing was the undisputed first hobby for many years. I didn't bring any sewing with when on holiday and I could sometimes get distracted by machine knitting but overall I was pretty faithful. That is, until some point between now and about two years ago when a sport started to get in the way. I have never been the sporty type but I did really fall hard for sport-climbing (no pun intended). Now, I also have a more demanding job than before, and my transformation into a climber is still going on. Lately, I have had even less time to sew because I have found something which combines my love for making things with my love for climbing: I'm learning to be a route setter at my local climbing hall! Oh, and please don't be too worried. I might cheating on my sewing hobby but I will never leave it. In fact, I have a new pair of 1940's style jeans to show you tomorrow.